These outstanding LSAT (law school admissions test) study aids are available through the best sources on the Internet for law school study aids, Law Books for Less and Law-Study-Aids.com Just click on the title to buy it now from Law Books for Less or our sister site, Law-Study-Aids.com ! Want to learn more about law school? 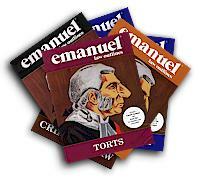 Tons of books on law school are available on our Law School Study Aids page!